Up for grabs today is 1 months supply Panda Liquorice Blueberry Bars thanks to Panda Liquorice. such was the overwhelming response that now new Blueberry bars are to be launched. liquorice experts at Panda HQ in Jyvaskyla - the Scandinavian home of all things liquorice. liquorice when youʼre out and about - so whether its a post gym boost, 3pm office treat or a healthier sweet for the kids lunchbox - Panda Blueberry bar is the perfect tasty, guilt-free snack. contains no nasties - so you can snack away happily. Did you know that blueberries....? Liquorice is naturally 50 times sweeter than sugar! Liquorice is one of the most popular herbs in the world - it has been used for thousands of years by the ancient Greeks, Chinese, Egyptians and Hindus for its medicinal qualities. Liquorice has a few glamourous claims to fame too! without worry. Panda Blueberry Bars are also suitable for vegetarians and vegans. 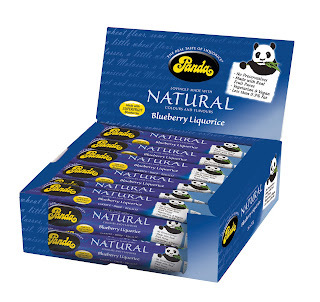 For more information on Panda Liquorice products, visit their website http://www.landofliquorice.co.uk/. You can also get all the latest news from them on their Facebook and/or Twitter pages. The "Red Panda Adoption Program" is at which zoo? Chester Zoo, its a brillliant zoo for anyone thinking of days out with their little ones.